Just months after Virginia Wettlaufer and Walter Tomenson started dating, she was diagnosed with breast cancer. Next came a crash course in commitment. "I felt a lump in my breast. After about a week of tests they came back and told me that I had cancer. Wally would give me shots, he would give me medicine, he would change bandages and drains. Everything you could imagine that you would never want the person you had been dating for six months to have to see, he had to see or deal with. Me being sick and physically what was wrong with me and what I was going through was my problem. I didn't want Wally, when I was like laying on the couch miserable to have to be sitting home with me. We should be young and going out and having fun." Hopelessly in love, in sickness and in health, Virginia and Walter fought cancer together. 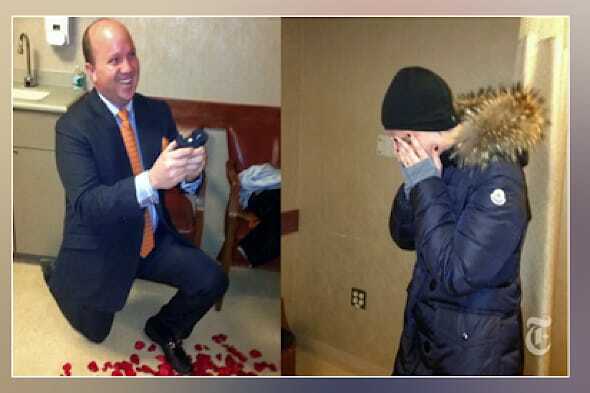 Walter proposed to Virginia at Memorial Sloan-Kettering, the hospital where she had received her treatment. "My status with cancer now is I have no evidence of the disease. I think if this had happened six months before when I was single and in my early-30's living in New York City it would have been a very different mental fight that I had vs. having just fallen in love with a wonderful person and then being given this challenge. He was 100% the reason that I wasn't gonna crack, I was gonna keep going, that I was gonna fight this and I was gonna win. I was gonna win for him. And for myself. But for us, you know?"